you, all those you care for and Everyone in California had universal, guaranteed, comprehensive and quality health care? join doctors in the fight for single-payer health care for every resident! The United States is falling behind Often considered a “world leader,” the U.S. is not leading the way in health care. Despite the fact that health care spending per capita in the United States is nearly twice that of other industrialized nations, recipients report less satisfaction and lower quality outcomes including common indicators of overall health, preventable death rates and infant mortality. The U.S. ranks 37th out of 1911 countries in overall health care performance. 45 million Americans2 forgo medications due to cost (nine times the rate of the United Kingdom). ife, Liberty and the pursuit of Happiness.” For every American citizen, these rights are enshrined in our nation’s Declaration of Independence. But today, the lives of millions of Californians are at odds with the greed and profits of corporate insurance companies. Single-payer universal health care has the power to change that. It can revolutionize California’s system by eliminating the private middlemen — who add nothing to health care but cost — and restore doctors’ and health care professionals’ ability to provide for patient quality of life. Single payer is the term used for a medical system which is publicly financed but privately delivered. It will be funded both in savings from the current system and existing tax revenue. It is only through universal, guaranteed, comprehensive, singlepayer health care that we can reassert and rebuild our dedication to medical practice and health justice. As California goes, so goes the nation. With the passage of new legislation such as Senate Bill 562, this single-payer universal health care bill will serve as a model for the rest of the nation to follow. unaccountable profits from insurance companies, hospital conglomerates and pharmaceutical companies under the current health care system that drive unaffordable care, massive inflation, advertising, lobbying and exorbitant executive salaries. Legislators are in financial conflict. Corporate media propaganda protects the fat cats while sowing confusion, distractions and misinformation in order to scare the public. For-profit medical administration makes our system rife with waste, fraud and greed at the cost of genuine patient care. •	High out-of-pocket expenses cause 12 million underinsured Californians (or 36% of the state) to forgo needed medical care. •	2.7 million uninsured (or 7.5% of) Californians cost care providers, federal, state and municipal governments billions of dollars annually. •	Patients with coverage are forced to navigate a maze of bureaucracy, often at a time when they’re least capable of doing so. •	Medical costs and debt are the leading cause of personal bankruptcies and cause business bankruptcy as well. Put health care decisions back into the hands of doctors, California-licensed professionals and patients — not corporations. Single-payer universal health care, the Healthy California Act (SB 562), will institute an independent Health Trust Fund with a publicly accountable governing board responsible for the oversight, structuring and financing of a not-for-profit system. Patients can seek and receive secure, individualized, comprehensive and noncategorical covered care for all services listed in the legislation. This starts with coverage for medical, dental, mental health, social health and rehabilitative care. (See what coverage everyone receives on page 3.) •	Statewide, estimated health care cost savings will be $37 billion through a lawfully established and completely independent California Health Trust Fund, formed solely for health care. •	Timely and transparent payment will be made to clinicians without the bureaucratic interference inherent in the current health insurance system. •	Everyone will benefit from lower prices and more accessible care through the “everybody in” single pool which will negotiate standard prices and shift the paradigm to a health care system focused on prevention and early intervention. •	There will be no out-of-pocket charges, premiums, copays or deductibles. •	Changes in employment, age, income or health conditions will not affect access to care, and businesses will no longer shoulder the cost of employees’ health care coverage. Insurance companies’ management and administration systems don’t contribute to any aspect of the patient health care in our existing, callous multi-payer system and only function as profit-absorbed middlemen. Their only role is to make money by blocking coverage and minimizing costs. 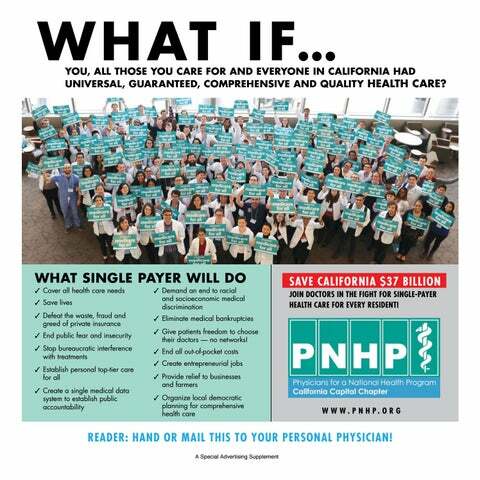 Single-payer universal health care will shift California from a system of medical care “ransom” where we are all “hostages,” to the benefits of true health care delivery. The Healthy California Act would end the rampant abuses and care rationing in our current for-profit system, expand our democracy, end the nightmare of medical fear and insecurity, and proudly unify all Californians. ur current health care system is immoral. Too many people either have no health care coverage or coverage that is very limited with high premiums, deductibles and copays. There are countless stories about people at their most vulnerable, dealing with a new cancer diagnosis or recovering from major surgery, who have to worry about enormous care costs. Often, they get calls from the hospital as soon as they get home with demands for payment, later threats of referral to a collection agency and the very real possibility of losing their home. I’m a retired physician. I worked at Kaiser for 30 years, where patients often didn’t need to worry about payment because their coverage used to be comprehensive. Since retiring 10 years ago, I’ve been volunteering at two free clinics run by medical students in Sacramento, Imani and Bayanihan. This is where I see what happens to people with no insurance. Many of our patients are undocumented and have no access to coverage. What we provide is care on Saturday, with no guarantee of follow-up or continuity — despite our best efforts. I took care of a 35-year-old mother of two who had been diagnosed and treated for thyroid cancer 13 years ago, at a time when undocumented patients were eligible for Medi-Cal. That is no longer the case. She needed a biopsy for a new lump in her neck, but couldn’t see her physician without insurance. I was told that to receive emergency Medi-Cal coverage she would need a letter explaining the gravity of her situation and to apply for a green card. Of course, she was worried that she would be immediately deported, and I couldn’t guarantee she wouldn’t be. By the time she finally jumped through all the hoops, her disease had already spread. Her story is not the exception. I saw a young man who was diagnosed and treated for severe ulcerative colitis when he had Medi-Cal. With no coverage, his disease had flared up leaving him extremely weak from constant bloody diarrhea and drastic weight loss, and unable to work. His medicine cost $3,000. I was able to get it for him one time, but he had no options for future treatment or care. Even if residents qualify for Medi-Cal there is no guarantee they will be able to get the care they need. Suffering is prolonged after patients are turned away from groups who have already met their Medi-Cal patient quota — as happens at Sutter, Mercy, UC Davis and Kaiser. By the time patients reach a clinic, they are subject to long referral delays, denials, early hospital release and uncontrolled pain. Health care in the U.S. is a two-class system. The less fortunate face the cruel reality that even if one has insurance it isn’t the same as having access to care. Everyone is entitled to excellent health care. Why are we allowing people to suffer and die prematurely from treatable diseases? George Halvorson, former CEO of Kaiser, also says single payer is the answer. an inter v iew wit h da v id sie g el M.D., M.P.H. capita of other developed countries, yet when you look at a variety Dr. David Siegel has nearly 40 years of experience in the health care system, during which time he’s seen just how insurance companies have influenced of any outcome measures, such as infant mortality, it’s poorer than the industry, diminishing patient care and undermining doctors’ autonomy. most other developed countries.” Photo by Anne Stokes Such was the case with a former patient with multiple sclerosis. Dr. Siegel prescribed physical therapy which can help patients maintain Doctors spend strength, mobility and slow symptom 868.4 progression. Her HMO denied the million hours claim. It took repeated phone calls from Dr. Siegel himself, and arguments with annually on prior authorization the insurance company’s utilization (Kaiser Family Foundation) department, to ensure her medically necessary treatments were covered. “If you can afford it, and if you have the right kind of insurance, the health care in the United States is at least as good if not better than anywhere else in the world,” he said, adding the caveat: “But it is not at all accessible for every person.” Dr. Siegel said there should be data-based checks and balances when it comes to medical care, but the determining factor should be patient needs and welfare — not insurance company profits. A single-payer system would enable doctors to do just that with minimum administration required. “I think it’s safe to summarize, in my view and the view of everyone in Physicians for a National Health Program, that health care must be viewed as a right and not a privilege,” he said. rivate insurers waste around $750 billion annually on non-patient costs and actions that don’t improve health. Instead they spend money made from premiums on things like administrative overhead, sales and marketing, lobbying, billing, underwriting and executive salaries. Dr. Paul Song has spent much of his 20-year career fighting for improved patient care, including supporting a single-payer universal health care system. I Professional realities A single-payer universal health care system will significantly decrease the amount of time, effort and money doctors are currently forced to spend on insurance-related administrative work — which includes preauthorizations, timely payment for services and claim denials. he medical industry is one of the largest sectors of concentrated capital in the U.S. economy, making up 17.9% of the gross domestic product (GDP) and rising annually. But who benefits? Industry companies, not patients or doctors. The economic and political interests of the wealthy have historically blocked any effort to establish health care as a right and public good. Instead, health care assets are consolidated and controlled by corporatization. The medical professional community has become subject to numbing, compromised, complicit and profit-corrupted practices. Fraud is built into billing practices across the entire industry. Medical outcomes are linked to a patient’s ability to pay and result in extreme levels of suffering and death near that of developing or low-income countries. Under the for-profit system, we are all “hostages” — professionals and patients alike — who pay a staggering and inflationary “ransom” for private and public insurance, with no sense of security and fear as the universal norm. The Koch brothers’ network, the richest 0.10%, are utterly self-focused, pitiless and unaccountable in their anti-social values and anti-democratic politics. We must look squarely at those who act in their own self-interest and whose greed, waste and fraud fund many key California legislators and the spread of misinformation. The opposition is calculating, and they disingenuously express “concern” about single payer with the intention of undermining and derailing genuine discussion. These opposers produce a flood of cynical legislation and sow dishonest doubts in order to protect private insurance and paralyze us from acting in our collective interest. An end to greed Profit. It’s the motive behind all of the decisions made by private insurance, hospitals and pharmaceutical companies. Claim denials, inflated prescription drug prices and plans that lack comprehensive coverage increase company profit margins and line the pockets of CEOs (listed at right) — all while millions of Americans find themselves underinsured or without coverage at all. The reality: Public uprising can overcome naysayers! Opponents state that the opposition of billionaires to “government-run” health care will make single payer impossible in this day and age but, historically, that’s not true. Throughout history, some of the greatest political and social changes have come from what people believed to be impossible. Sometimes from the political right, as we saw with the rise of the Tea Party under a Democratic president, or the election of Trump himself. Now is the time for doctors and health workers to lead single-payer supporters to enrich the conversation, instead of letting others rampantly spread misinformation through lies and bribery as they’ve been doing for decades. California leaders will fight and sue for our full and lawful federal reimbursement with single payer. It is our money to use for our people! obstacles prevented previous administrations from changing health care, so why bother? It’s too difficult. History has shown that positive change can be established when advocates establish a strong moral goal and fight for it, adapting to reality along the way. Each year, nearly 45,000 people in the U.S. — and according to PNHP estimates, 3,600 people in California — die from lack of health care coverage. Tens of thousands more experience great suffering because they either have no access to care or cannot circumvent impossible copays and deductibles. Success will come by setting real policy law for health care justice that will motivate the majority. Opponents say: “Who will pay for single payer? Uncontrolled industry costs and new taxes will break the bank.” The reality: The majority of single payer will be fully funded with major savings from new health delivery, corruption reforms and already existing public funding. Single payer would use $331 billion of existing money, 71% of which is already covered by state and federal taxes. Scare tactics are the way opponents can try to block new and progressive policies. It is a gross and repeated lie that a singlepayer health care system will need a new $400 billion to fund it. Similar “large expenditures” are never opposed when they benefit the top 1% in wealth transfers. Examples include the Tax Cuts and Jobs Act with its $1.4 trillion increase for the U.S. deficit, the Affordable Care Act that approved almost $800 billion of tax money over 10 years to help subsidize private insurance, or when the government launches new wars or bails out banks. In these cases, fears of “how will we pay for it” simply vanish. The corporate media’s consistent bias predicting huge new taxes, and dismissing the public will for thorough health reform, is used to paralyze and terrify the public in order to undermine and block single payer. •	David M. Cordani: $43.9 million/year President and CEO, Cigna Corp.
•	Michael F. Neidorff: $24.9 million/year Chairman and CEO, Centene Corp.
Total compensation comprised of salary, non-equity incentive plan compensation, value realized on exercise of stock options and vesting of stock awards, and all other compensation as last reported to the U.S. Securities and Exchange Commission •	Robert A. Bradway: $19.1 million/year as of April 13, 2017, unless otherwise noted. 1 Chairman, president and CEO, Amgen 2011 compensation, Fortune. 2 2013 compensation, SEIU-UHW. Costs that make medical care unfair Too many Americans are struggling to meet their health insurance premiums, whether they are buying plans as individuals or business owners. Those costs don’t go toward quality patient care, but keeping the current medical illness system in place. End political corruption Contributions from the medical care industry keep elected officials in place who will protect the current industry’s interests. •	Jerry Brown, Gov. of California Received $2,743,307 in contributions Publicly skeptical of single-payer system. •	Anthony Rendon, California State Assembly Speaker Received $434,089 in contributions Shelved single-payer health care legislation SB 562 and prevented it from moving to Assembly for a vote. •	Jim Wood, DDS, California AD 2 Received $314,943 in contributions Co-chair of California Assembly Select Committee on Health Care, prevented SB 562 from moving to a vote. •	Joaquin Arambula, MD, California AD 31 Received $134,100 in contributions Co-chair of California Assembly Select Committee on Health Care, prevented SB 562 from moving to a vote. means the public has more dollars to spend on local businesses and revenue streams. “Every $1,000 in increased income creates $1,530 in economic activity,” Lighty said. “And we know low-income workers currently use a disproportionate amount of their income for health care costs.” Perhaps even more important, employers can get out of the health care business. No longer will businesses be burdened with comparing policies, reading fine print or sacrificing coverage benefits for cost savings. Lighty upheld that a single-payer universal system frees both employers and employees from making professional decisions that revolve around health care — stimulating California’s economy even further. For instance, Californians will be free to start their own businesses and create jobs without fear of losing their own health care coverage or bankrupting their new business with health care costs. Older employees will be able to retire when they are ready and still keep their health care coverage, opening up full-time positions in the workforce for younger generations. “It would end ‘job-lock,’” he said, “which is the fear of losing your coverage by changing jobs.” A single-payer universal health care system will also focus on preventive care, not profit margins like our current system. Keeping workers healthy and productive instead of missing work — which costs California an estimated $1,700 a person, up to $28 billion a year, according to Lighty. Even the most conservative estimates predict the state itself will save $37 billion annually by adopting a single-payer system. This will save California money while providing every resident with comprehensive coverage free from deductibles, copays and premiums. “With single payer, we’d go from spending $368 billion to $331 billion on health care,” said Lighty. Health Care for all is within our reach, but doctors and health professionals must lead the change with courage, conviction and integrity! This is a partial list of supporters in favor of SB 562, pending needed amendments to the legislation — full roster totals over 600 endorsers. 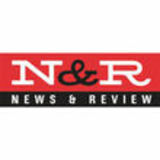 Advocates of health care reform since 1987, Physicians for a National Health Program (PNHP) contributes to the health care debate and educates public influencers on the benefits of a single-payer system. As a member, you will join 40 chapters and over 22,500 members who have access to leadership training, national office support, physician members in your community and groundbreaking materials. our oath and purpose calls us to act!